More than a couple of PCGamesN staffers read White Dwarf in their youth, and its influence breaks cover whenever we write a battle report for XCOM or Card Hunter or whatever next turn-based tactics game we’re due to fall head-and-heels for. So despite the initial disappointment with Full Control’s Space Hulk adaptation, and despite the slow-burn realisation that its problem lies with the dice, this Fangs of Fenris DLC more than piques our interest. The three mission campaign was first published in White Dwarf #200 in 1996, and will makes its first digital appearance as a Space Hulk add-on by Christmas. Fangs of Fenris features the Space Wolves, who’ll need no introduction to those with a passing familiarity with 40K. Everybody else, think Space Marines dressed in furs and an authority complex. The Wolf Guard’s terminators will bring their weapons with them: Frost Blades, Frost Axes and Wolf Claws. 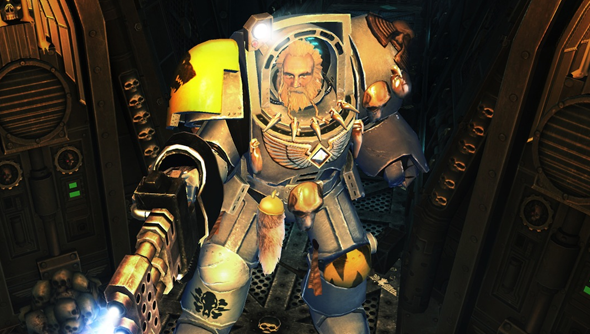 “When it came to selecting the first expansion chapter for Space Hulk we felt that the introduction the Space Wolves would be both a great addition to the game, and a nod to the fact that our studio is based in the heart of Scandinavia – the Viking kingdoms of the past,” said Thomas Hentschel Lund, CEO of the Danish studio. No Space Marine chapter can call themselves immovably resolute until they’ve run a Hearthstone beta key giveaway, in my book. Still: new methodology is always welcome in a game as tough as Space Hulk. As is the 33% offSteam sale, due to run for 24 hours this Saturday, October 12.